Would you think me weird if I told you my most favoritest vegetable in the world is the Brussels Sprout? Of course you would. Actually, you’d just add it to the list of my many weirdnesses. But it is true. I love those little green cabbagey globes. Even as a kid I loved them – and that was back when the only way they came was in a little square frozen box. My, how times have changed. Now, you can get them fresh and still on the stalk! On my last trek down to Gentile’s I saw some and it was my impulse-buy of the day. Victor is not a huge fan – definitely not as much as I – so I tend to buy them sparingly. What surprised me about buying them was they were pretty big – and I generally go for the smaller ones. As I said… impulse buy. Another of my favorite vegetables is fennel. It’s something that, like carrots, celery, and onions, is always in the house. So what better thing to do than to combine two of my favorites for dinner?!? I was originally planning chicken thighs with eggplant – since the eggplants are in overdrive mode, right now, but when I opened the ‘fridge and saw the brussels sprouts, the wheels started turning. Next thing I knew, there was fennel, red onion, garlic, and brussels sprouts on the counter. A recipe was born! I started by browning the chicken thighs in an oven-proof pan. 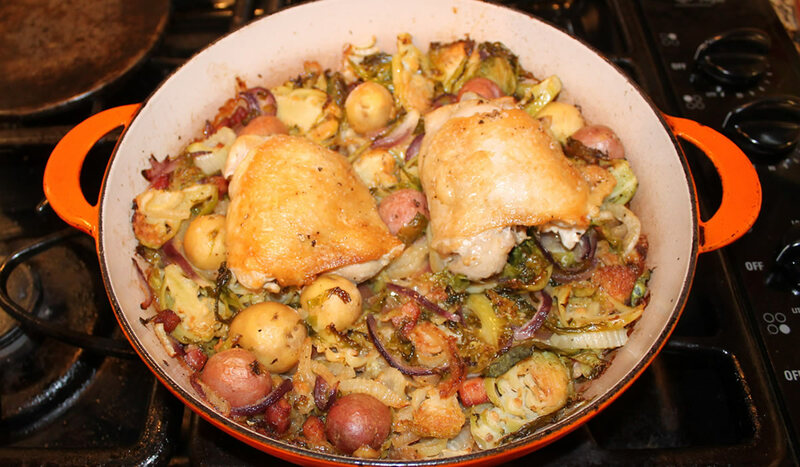 I took them out of the pan and added diced pancetta, and let it brown nicely, Then I added the sliced brussels sprouts, sliced fennel, sliced red onion, and a couple of baby potatoes. I cooked everything down a bit and then added a minced clove of garlic and some salt and pepper. Next was about a half-cup of white wine. I cooked that down a bit, added the chicken thighs back on top, and put it all into a 375°F oven for 30 minutes. I have to admit, this came out pretty good. Victor loved it – the brussels sprouts didn’t taste like brussels sprouts! The fennel and onion really mellowed them out. And after way too long only buying boneless, skinless chicken breasts, I’m back to buying bone-in, skin-on thighs. Not only are they half the price, they’re also a lot more flavorful and can be cooked in a lot of different ways.